Flocks of robins: A sure sign of winter? Two years ago, shortly after my first column, I received an e-mail from a reader in Winfield. He’d just seen a robin in his backyard and wondered how that could be so in the dead of winter. Why didn’t the bird fly south? Well, turns out it probably did, and I’ll get to that in a moment. The subject of wintering robins recently came back to mind when I was birding at Herrick Lake Forest Preserve in Wheaton. I was participating in the Audubon Society’s annual Christmas Bird Count, surveying the area with two other heat-challenged souls. Mid-morning, we encountered hundreds of American robins—far more than could be expected on a bitter cold December day. Most of us think of robins as one of the traditional heralds of spring, and local robin populations do indeed skyrocket in March and April. But robins are in fact a fairly common winter resident in DuPage County—they just keep a lower profile. 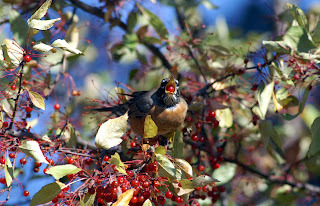 To find food, primarily berries, they hang around thickets and woods instead of our frozen yards. So robins are with us now if you know where to look. Still, like the Winfield reader, I wondered why any robins would be here during the winter. Most robins spend the non-breeding months in the southern states and Gulf Coast. Some go as far as Guatemala. For answers, I turned to Doug Stotz, conservation ecologist and ornithologist at Chicago’s Field Museum of Natural History. He explained that the robins we see in winter are likely not the same birds that bred here last spring and summer. Our local breeding robins tend to migrate south, so the birds we see now came from up north. Chicagoland winters are no bargain but life could be worse in places like northern Wisconsin. Makes sense. But why stop here? “It’s true that farther south one’s life would be easier,” Stotz said, “but there are advantages to wintering farther north. One is that migration is a dangerous business. It’s probably more dangerous than getting through the winter if the minimum you need to survive is present. Most robins we see in winter are males, Stotz says, adding that males of just about all migrating songbirds return to their breeding grounds before the females. So staying here gives them a jump on things in early spring. Male robins are easily distinguished from females by their bolder orange breasts and darker heads. There is evidence that the “winter range” for American robins has been extending northward in recent decades. Stotz credits milder winters, more fruiting ornamentals in our yards, and increasing fruiting bushes (mostly non-natives like buckthorn and honeysuckle) in forest preserves. Increasing overall robin numbers play a role, too. Residential areas are ideal habitat for breeding robins, so increasing land development has helped the species thrive. For Stotz, for me and many other area birders, the first avian sign of spring is not the appearance of robins but red-winged blackbirds. In late February, males will begin establishing their territories. 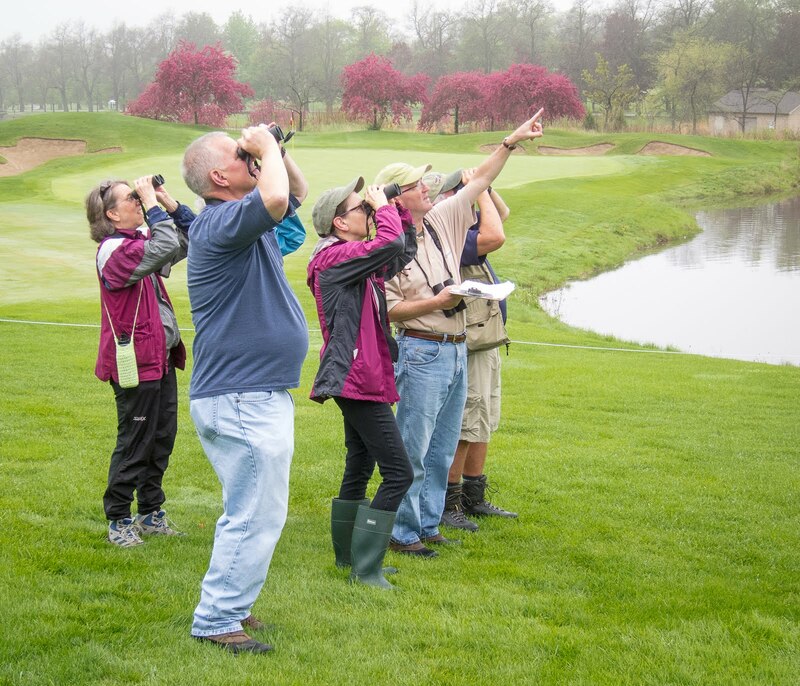 Visit a local marsh to see and listen for yourself—it’s a wonderful show! But let’s appreciate our robins, too. Especially the hardy ones that brighten the winter landscape. Copyright 2006 by Jeff Reiter. All rights reserved.